When you see a big red “STOP” sign, your first thought is “STOP!” But have you ever wondered what the sign is made out of? Or how the contents may affect you? Take a second and think about how many “STOP,” “YIELD,” “DEAD END” and countless other varieties of small, pole-mounted road signs you see on your daily commute; almost all of these are made of aluminum, though that might not be the case for much longer. 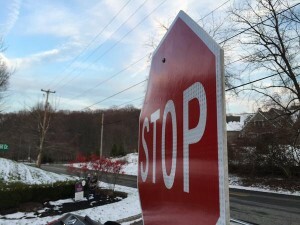 A stop sign in Pennsylvania made using EcoStrate. EcoStrate SFS, Inc., an SPI member that successfully created a substrate material sourced from 100-percent post-consumer recycled material, landed a $1-million grant from California DOT CalRecycle (sharing half of it with Reliance Carpet Cushion) to manufacture road signs made from materials such as carpet, computer carcasses and carpet padding, textile waste and other waste products. In addition to road signs, the material will also be used to build indoor/outdoor Americans with Disabilities Act (ADA)-compliant signage and flooring. For EcoStrate, the grant is the culmination of a lengthy process of developing the material and then identifying applications where it could be used. Ron Sherga, the founder and CEO of the company, identified an opportunity to take a billion-pound waste issue and create a substrate that is green in both process and solution. He then brought on Ron Simonetti as the company’s chief operations officer and they began developing the technology. Simonetti said the situation is much the same for the appliance plastics stream as well; instead of being recycled or reused, the plastics from appliances are often baled and shipped to Asia as scrap. So, in addition to presenting a more sustainable, eco-friendly option to aluminum, the EcoStrate model also benefits recyclers by giving them another option besides baling and exporting these types of plastics. “A lot of those guys are facing green fence issues and inconsistent demand,” Simonetti said. “We are working with them to create a more consistent outlet with our product to be used in the marketplace here, domestically.” Moreover, EcoStrate engages its partners who grind up the plastic e-waste and appliance waste so that it can be used in EcoStrate’s substrate. This process too gives grinding companies a consistent outlet for business. “We’re solving problems for those industries,” Simonetti added. The grant from CalRecycle has boosted EcoStrate’s outlook but the work continues, on testing and on clearing their material for use across the country. “We have partners like DuPont, which has helped us to support R&D, and the Carpet America Recovery Effort (CARE) too,” Simonetti said, noting that the market for aluminum signage in the U.S. is around 500 million square feet of material per year. “We’ve applied in all 50 states to get our product approved for use in pole-mounted signs,” Simonetti said, meaning consumers can expect to see more of EcoStrate’s materials on their commutes moving forward, whether they know it or not.